With its gun-metal grey color scheme, gold details and dark-brown PCB, ASRock's Z77E-ITX looks stunning. 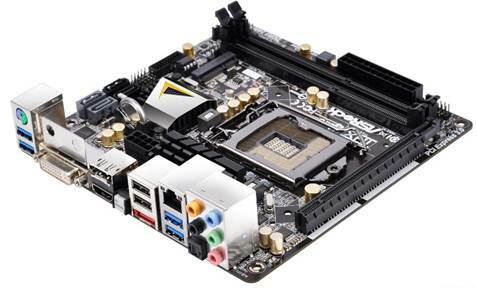 ASRock has opted for a 6+2 power phase design, while the PCB is surprisingly devoid of large heatsinks, with just a single chipset heatsink, and a small stack on the VRMs behind the I/O ports. Layout is generally problem-free too, although the 12-pin EPS12V connector is wedged between the VRM heatsink, battery and I/O ports, along with the cables for the Wi Fi module nearby, which is a tight squeeze. Other than this, there aren't any major issues. The two SATA3Gbps and two SATA6Gbps ports are located at the edge of the PCB, along with the USB 3 header and 24-pin ATX connector. The PCI-E graphics slot is free from obstructions, with the audio header situated well out of the way, unlike the Asus P8Z77-I Deluxe's slot. The CPU socket is relatively clear too, although the EPS12Vconnector may interfere with large heatsink or water block mounts, as it lays right on the edge of the marked exclusion zone. An mSATA connector sits underneath the PCB for connecting supported SSDs, while a mini PCI-E slot is occupied by the on-board WiFi module (an antenna is included in the box), so there’s no spare slot as there is on the Zotac Z77-ITX WiFi. However, the Z77E-ITX has two more USB 3 ports than the Zotac, along with an eSATA3Gbps connector, DVI and DisplayPort outputs, and a single HDMI port. There are no power or reset switches, nor a POST error code readout, though, which is a shame, although you can at least reset the CMOS using an I/O panel switch. You might find it hard to connect all your case fans to the Z77E-ITX, however, as it only has two 4-pin fan headers. This is the same with all the boards on test, though, and looking at the PCB, it’s difficult to see where ASRock could fit another. Sadly, the box didn't include any means of using the motherboard's USB3 header either, so you'll have to invest in a breakout adaptor if you need more than the four USB 3 ports on the I/O panel. Like the Zotac, the Z77E-ITXfailed to Turbo Boost all the way to3.9GHz, only reaching 3.7GHz, so its performance results were, not surprisingly, a little slower than the Asus board at stock speeds. Its image editing score of 1,775 was 49 points off the pace, while it was 135 points behind the Asus board in our CPU ­intensive video encoding test. Overall, it managed 2,140-70 points short of the Asus board, but this is tiny in percentage terms. Meanwhile, its minimum frame rate in Arma II was 123fps - roughly equal to the Zotac, while its SATA 6Gbps speeds were slightly faster. The Z77E-ITX is equipped with far more overclocking and monitoring features than the Zotac, though, while its EFI is much easier to use and navigate, although Asus still has a clear edge here. Its AXTU tuning software provides basic control of fans and overclocking, while the EFI has almost everything bar a fully manual CPU PLL voltage option, which the Zotac also lacked. However, its maximum CPU voltage of 1.7V is more than enough to deal with enthusiastic benchmarking. We needed a far less crazy 1.28V to get our CPU to its usual 4.8GHz- a brilliant achievement for this tiny motherboard, and it needed far less tweaking than the Zotac too. Our CPU topped out at 98°C using a Corsair H100 all-in-one liquid cooler at these settings, so heat was the limiting factor. The EFI also includes some auto-overclocking features, although our manual settings worked better. We set the CPU frequency to 4.8GHz and the EFI changed a few options, although these didn't prove to be stable, with the CPU voltage of 1.24V not providing adequate power. Either way, the overclock saw excellent gains in our benchmarks. The image editing score rose by 555 points to 2,330, while a massive 1,171 points were added to the video encoding test score - an increase of 38 percent. Arma II also saw some sizeable gains, with the minimum frame rate rising 12fps to 135fps. Its maximum CPU voltage of 17V is more than enough to deal with enthusiastic benchmarking. 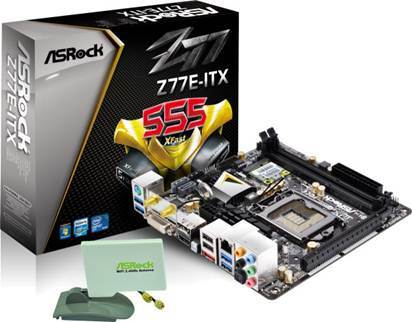 ASRock has come up trumps with the Z77E-ITX. It has an easy-to-use EFI, it took our chip to its limit when overclocking and, in doing so, matched the performance of much larger, more expensive motherboards. It also has nearly everything you need for a powerful PC, with the added bonus of Wi Fi, mSATA and mini PCI-E ports. At $184.5, it's the same price as Zotac's Z77 offering; however, with its superior EFI and more balanced feature set, the Z77E-ITXjust edges the Zotac into second place. The tricky decision is when comparing it to the Asus P8Z77-I Deluxe. This has an even better EFI, and superior tweaking and monitoring tools, plus a few additional features. For this reason, despite costing $30 more, the Asus is our mini-ITX board of choice, but if you'd rather put that money towards a better CPU cooler or higher-capacity SSD, you'll be far from disappointed with the ASRock Z77E-ITX.